Just for fun I decided to launch this site, in many ways as an accompaniment to my monthly gardening column. But don't expect me to be tied down to the computer every day - there's too much to life for that. On this day, I salute the loveliest flower in my garden, my dog Daisy. 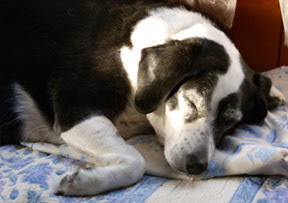 This is the seventh anniversary of her arrival at our home. Like any momentous occasion, nothing has been the same since.